As the Poolesville Community Garden winds down its first year of operation, it's been great seeing the church and our partnership with Poolesville Green, the town, and local businesses thrive. It's exciting, and a blessing, because gardens are a wonderful, amazing way to be fed. I feel that in my own little plot of land, over in Annandale, where I've been working to bring the fruit of the earth from my own four-by-eight patches of heavy Virginia clay. Gardens are good, honest work. They nourish us and feed us, and that nourishment goes well beyond the delicious, local and fresh food they provide. As my pastoral imagination is discovering, they are also a nearly endless font of metaphors for faith. Lord help the congregation. This year and last, it's been green beans at this point in the season. I went with bush beans last year, for the sole reason that I saw a packet of them at the supermarket, said to myself "Ooo I'd like to grow beans," and went with it. Honestly, I thought I was buying pole beans, which are much, much more productive on a small plot. But we often don't pay attention during an impulse buy, because, you know, it's an impulse. Oops. Those seeds did well, though, filling my family table with green beans for over a month, and giving me enough to share. They did so well that I decided I was up for it again. I selectively seed-saved them from last year. I over-saved, in fact, meaning I ended up with way more seed than I needed. That meant that I was going to go with bush beans again this year, no question. But it also meant that this year, I wanted to try something different with those beans. An experiment in weed control, if you will. The instructions for the beans suggested planting in widely separated rows, with plants a good distance apart. I'd done that last year, and the plants had done well. They had lots of light between them, and lots of distance and space to expand. But that distance made room for the weeds, which proceeded to grow fiercely in the spaces between the plants. I had to attend them to on a semi-daily basis, which I kinda sorta did. This year, I thought about those bushy plants, and the shade they'd cast if I let them nestle up a bit closer together. So three rows on the plot became four rows. The space between the plants went from a foot to eight inches. I prepped the clay with richer earth, and aerated the soil, and laid the seeds in. The plants shot up fast in the well-prepared soil, and after the first month, I found that I no longer needed to weed. They'd grown up so thick and so tall that they'd woven themselves into a single cohesive thing. 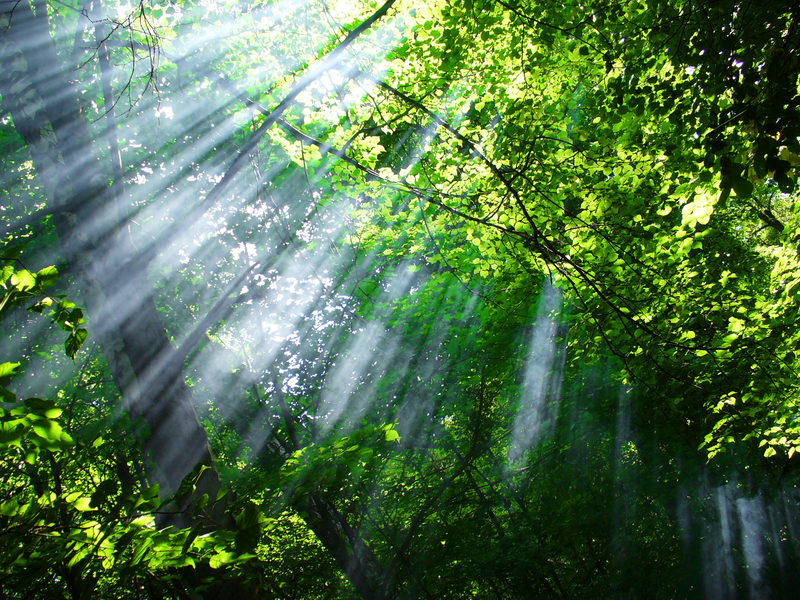 They were capturing all of the light, forming a dense canopy over the soil. Bending down and peering through them at ground level, it was like a forest of towering trees, beneath which very little else could grow. Every one of those bush bean plants was helping every other one of those bush bean plants. They were working together, keeping other plants from taking the nutrients and light that would fuel their growth. They seemed...happier...together. Not to mention that their yield has been a little overwhelming. Green bean casserole, anyone? Baked cornbread battered greenbeans? How about a green bean smoothie? Hmmm. Maybe stick with the casserole. If we want to live a gracious life, one defined by the Way that Jesus taught, it's helpful to approach our thoughts and actions in the same way those beans have flourished. We all want to be good, want to shape ourselves as good people. The peculiar thing about grace and kindness is that it thrives the more we act upon it. Every good act supports every other good act, like bean plants that knit themselves together to form a canopy. If we space our opportunities to express grace into the world too far apart, distracted by busyness or stress, we leave room for "weeds" and the influx of other, more negative ways of being. It's why getting into the habit of showing simple kindnesses, mercy and forgiveness is so important. Growing those moments so thick that they form a canopy of grace is a good way to grow as a human being. As we tend to the gardens of our souls, it's a good thing to keep in mind.